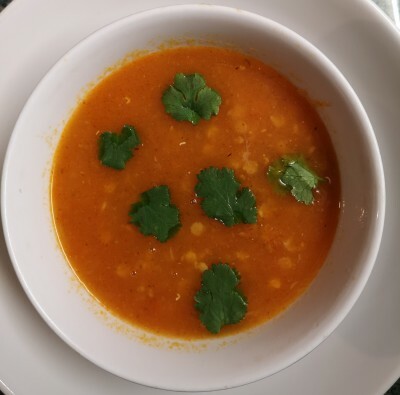 Here is an excellent nourishing and warming soup made from simple readily available ingredients! Great for the start of the 6 Nations rugby season. This recipe will make about 8 bowl portions. Preparation and cooking time 40min. Add the onions, garlic, carrots, celery to the olive oil in a large saucepan. Sprinkle over some salt, cover and cook gently for a few minutes until softened. Add the tomatoes and the tomato puree, sugar, spices and herbs. Add the stock, cover and simmer gently for 30 minutes until vegetables are tender. Blend until smooth and then add the red lentils. Simmer gently for another 15min. Reheat briefly before serving. Add a sprinkling of chopped coriander leaves or parsley and salt to taste.